Welcome to Wag Time Dog Training! Fun, Professional, In-home Training for your "Best Friend"! Hello, and welcome, to Wag Time Dog Training. We're Northern California's local, professional, trustworthy providers of private, in-home dog training covering greater Sacramento and Roseville, and we put the "fun" in the fundamentals of obedience training! Thank you for checking us out! We love dogs, even at their flower-digging, carpet-chewing, guest-pawing worst! That is why we are here – to help dog-owners build a wonderful relationship with their "Fifi" or "Fido." We successfully teach your dog basic obedience in a rewarding manner and positive environment. We come to your home to conduct the training because this is convenient for you, and, it's where your dog is most comfortable and where the problematic behavior often occurs. We are licensed, bonded and insured and can help you effectively deal with such challenges as potty-training, jumping, nipping, barking, chewing, leash pulling and more. Please call or email Wag Time Dog Training today to schedule your first in-home evaluation and training session and watch your dog become a more relaxed and responsible member of your household!! 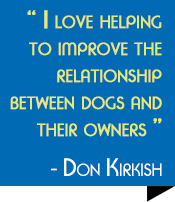 If you had known Don Kirkish as a kid, it wouldn't have seemed far-fetched that he would turn to dog training as a second career later in life. Back then, you would often find him in his back yard in San Jose, California teaching the family dog new tricks. He has both owned and loved dogs ever since. It wasn't until he hired a professional trainer a few years ago, to help obedience train one of his dogs, that Don absolutely knew he'd not only stumbled upon a training method he loved, but that he had found his life's next calling! Excited to act on his discovery, Don sought the experience of this renowned trainer to teach him the techniques that have proven so effective over his career. 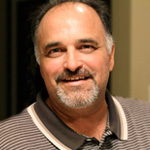 Don's mentor has been training dogs for over 40 years, has co-written and published several books on the subject and had his own television series. After spending many evenings and weekends, over the past few years and training under this expert's tutelage, Don began working with a mix of his clients, while expanding his experience to include his own client base. Don has seamlessly blended the knowledge and skills he has acquired during his training, with his natural affinity for animals to help other dog owners become happy, loving pet-parents to even the most pugnacious Pug, terrified Terrier or incorrigible Corgi! Just as the playful name "Wag Time" implies, Don's training style is predicated upon teaching dogs to learn in an environment that fosters fun and happiness. Establishing a good relationship with your dog is first and foremost; the training comes afterward. Basic obedience lessons will cover the commands sit, down, come, heel and stay, most conveyed by voice and hand signals. During evaluation, Don begins by building a trusting relationship with your dog. Even in the earliest stages of training, you will see a transition in your dog's behavior, right before your eyes. As the training progresses, Don works to transfer the knowledge and techniques necessary for the owner to become an effective "handler" of the dog. He will show you how to nurture and improve the relationship, so both you and your dog enjoy the new dynamic.